Buddha Garden is a 10 acre farm. As the map shows, we have divided it up into different areas according to the work we do. THE VEGETABLE GARDENS; these are in the centre of Buddha Garden and are protected by a secure fence and cow traps on all the gates that lead into it. This is where most of our farm activities take place. In this area we also have Pryog orchard, a place for people to come and learn aboutthe food producing trees that grow in this area. VAIYUBHOOMI; or ‘land of air’ is where we grow our cashews and a variety of other fruit trees. We also have some vegetable beds that grow more long term crops at certain times of the year. JALABHOOMI; or ‘land of water’ is where we have built three water retention ponds. In this area there is also the stone circle, fire place for bonfires and patches of forest. 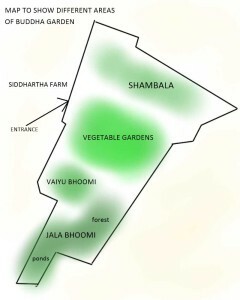 SHAMBALA; is the area that Pierre takes care of and includes vegetable beds, a nursery and fruit trees. You can find more information about each of these areas by clicking on the relevant button in this section.